On January 20, 2017, the Cleveland Metro Ski Council had 96 people depart the USA for a great ski trip to Chamonix, France. Several people were going to Europe for the first time while other people in our group had been to Europe several times. In either case, we were all excited and looking for a great time on and off the slopes. The town of Chamonix was a great town with the true atmosphere of Europe. The charming town was filled with great places to shop, share drinks, and places to eat. Several times after skiing we would meet somewhere for some Après-ski. This year Europe did not have a stellar year for snow, but fortunately a couple weeks before our arrival they received a good amount of snow making our conditions good. We didn’t have the powder we had in Zermatt 2 years ago, but we had well-groomed runs to ski on. We had many people go to a variety of ski areas since we had several people. Well it was me, the Mike and Tara Popik, Michael Duvall and Craig Healey and we were at Balme and we were close to the Swiss side skiing an off piste bowl and it was closed at the bottom so we were trying to traverse left and he somehow got ahead and separated and ended up getting to the bottom with the resort nowhere in sight and he knocks on a little cabin and this little old couple invites him in for coffee and he sits and talks ( kind of English) and they offer him a ride back to the lift in the little car on these winding roads ..we end up finding him again on the hill like 2 hours later. Karen Moyer and Bob and Patty Jackson: What is the attraction to skiing in Europe? Is it skiing the Alps? The challenges that European skiing presents? Or, the check off on the bucket list? The attraction for us was skiing Chamonix, being able to ski multiple countries at one time (France, Italy and Switzerland), and going with fellow Clevelanders. There are lots of things to consider if you want to venture to this part of the ski world; let me review our January trip with Cleveland Metro Ski Council (CMSC). Six of us from the Chagrin Valley Ski Club (CVSC) joined the CMSC trip to Chamonix, France. The CMSC group stayed at two different hotels in Chamonix, Hotel Alpina and Hotel Prieure. The CVSC group was all at the latter which had tons of charm. It was a boutique hotel that had been totally refurbished about 2 years ago. We purchased the Mont Blanc Unlimited pass which gave us access to the most areas and countries we could ski. The ski pass includes local transportation, with a bit of an added charge for some of the areas further out. 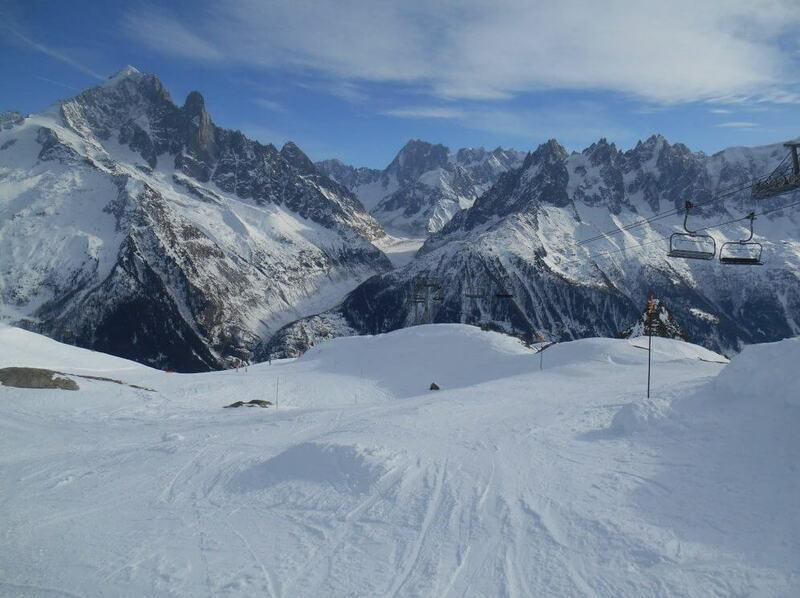 We ended up skiing 4 days at BreventFlegere, Grand Montets and twice at Courmayer in Italy. We purchased a 6- day pass which included access to some of the great sites in the area which we took advantage of on our day off. The 6-day pass was 300 Euro for me and 254 for those over 65. We got a discount for ordering online and picked up the pass on the day we arrived. Terri Lastovka met a long lost friend on the trip and here is her experience: While gathering all our people when we first arrived at the Geneva airport, the woman standing next to me looking very familiar. Then I saw her husband. Bob’s company was a longtime client many years ago. Haven’t seen Bob and Patty Jackson in 24 years. How fun!” Hats seemed to be the thing in Chaminox. At the last happy hour bunches of people showed up sporing new knit hats.” Keri Cavanaugh tells us about her experience at Les Houches: We started at the top of the World Cup downhill race course and we wanted to see how long it would take us to get to the bottom compared to the professionals! We of course had to stop a couple times to rest the legs and wait for others but even with those few 20- second stops it still took us eight minutes to get to the bottom and at certain points we were going over 54 miles an hour! It sure is amazing how the professional racers can do what they do!